This reclining deer with its legs folded along its body, oval-shaped head held high and its muzzle in the air, seems almost alive. 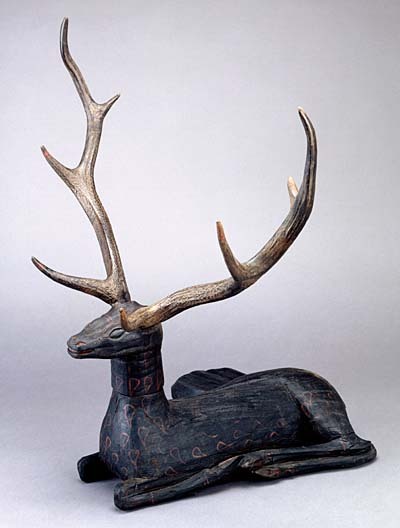 It is composed of three lacquered wood elements, topped by a pair of fossilized antlers bearing polychrome traces. A flat disc serving as a drum is fixed to the rear hind flank. The droplet motifs on the coat point to the sika, a species of deer widespread in southern Asia. The auspicious nature of this animal may explain the realism with which it is portrayed, related no doubt to the efficiency of the object’s magical function. The head is fixed to the body by a tenon joint. The almond-shaped eyes have been outlined with a gouge, the mouth sawn out, and the limbs fashioned by means of an adze. Some cracks on the animal’s back are the result of a prolonged spell in damp surroundings. The color, however, has only slightly darkened thanks to a mercuric sulphide-based coloring agent, which has reduced decay. Similar models have been unearthed at Jiangling in the N°10 Yutaishan tombs where they acted as guard animals. These highly realistic objects sought to capture the magical properties and soul of an animal whose life depended on its antlers, a process in which the beat of the drum during ritual ceremonies perhaps also played its role. The emergence of such animal figures formed part of the gradual evolution of the typical Chu magical bestiary from stylized to realistic forms. The Chu kingdom was one of the independent Chinese states that existed before the whole country was unified by the first emperor Qin Shi Huang in 221 BCE. It occupied a large area of southern China and was one of the major powers during the Warring States Period (prior to 221 BCE).